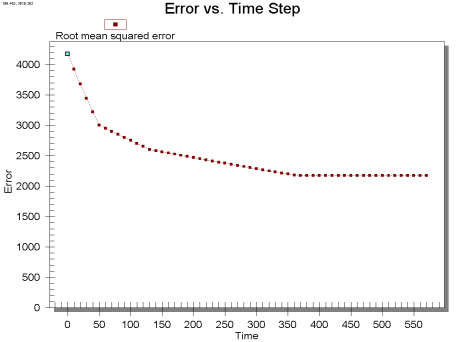 An Error vs. Time Step plot is used with transient simulations to display the mean error, mean absolute error, and root mean squared error between a solution and observed data as a function of time. This plot is shown for a single dataset of a mesh or grid as an average of all observation points assigned to the specified measurement type in the Observation coverage. The measurement type should be defined as a transient measurement. Although this plot can be used for constant measurement types, only a single point will be shown in the plot, and most would be better off using the Error Summary Plot. Transient measurement types will show the average errors at each time step of the data set. Error vs. Time Step plots are created in the Plot Wizard by setting the plot type to Error vs. Time Step. A sample plot is shown in the figure. After the plot type is set in the first step of the Plot Wizard, the plot options are shown in Step 2 of the Plot Wizard, contains the following options. Computed – This lists all available datasets. The dataset to be analyzed should be chosen. Check Box Options – There are three options that can be turned on or off. The three options determine whether the mean error, mean absolute error, and root mean squared error plots should be shown. Because these values are an average of all observation points, their line and symbol styles are not linked to any one observation point, but can be defined by clicking on the appropriate canvas window in the dialog. This page was last edited on 8 February 2017, at 22:11.